Fair warning to fans of high-end audio: Don’t sign up for the free two-week trial to Roon Labs’ Roon media server unless you’re prepared to commit to the $119 annual subscription. Once you’ve spent some quality time listening to music and managing your music library with this software, you won’t want to go back to whatever you were using before. Who the heck is Roon Labs, you ask? It’s a brand-new company, but one whose founders have a history of developing high-end hardware and software. They launched their first product—the $10,000 Sooloos music server—in 2007. That quickly attracted the attention of Merdian Audio, which acquired Sooloos in 2008 and incorporated its technology into its own streaming-audio systems. Earlier this year, Meridian spun Roon Labs out as an independent software developer. The Roon music server runs on either a PC or a Mac, but it can manage your music library wherever it’s located on your network: on the computer’s hard drive, on a NAS box, or in folders on multiple networked devices. And you can establish multiple user profiles so that each person in your household can compile their own lists of favorites and have their own unique play history and music recommendations. If mom and dad hate the music the kids are listening to these days, they can ban that music so it never plays on their profiles. You can install Roon on one PC or Mac to manage your music library (which can exist anywhere on your network), but you can install it on as many other computers as you'd like. These other machines can be used as remote controls for the primary computer or as independent streaming clients. 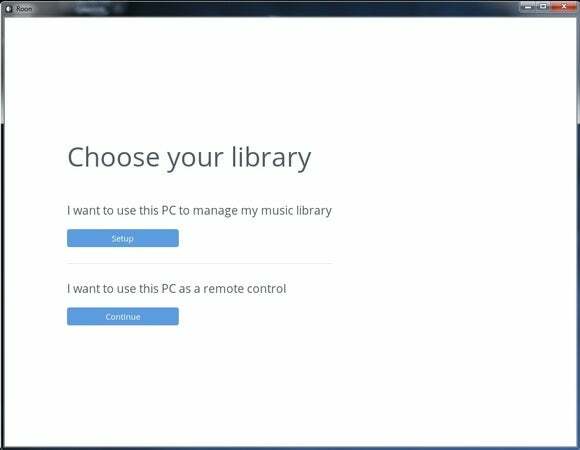 Install Roon on other computers (endpoints) on your network and you can use them as remote controls for the primary computer’s audio system, or you can stream your music over your network to those endpoints. In both scenarios, you can choose between the computer’s onboard audio subsystem and any connected outboard hardware. 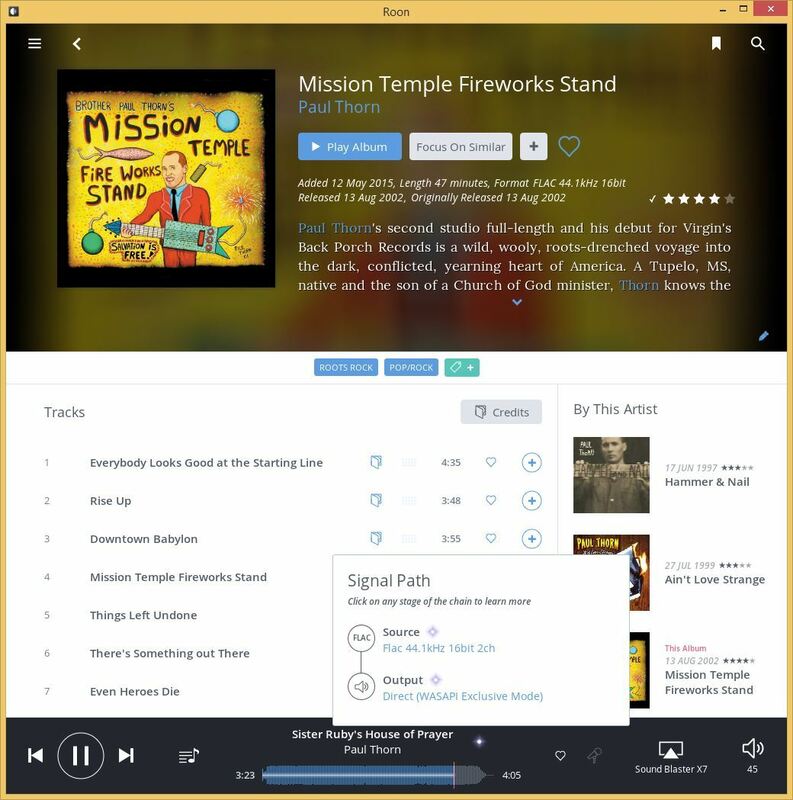 Roon is an awesome tool for music playback, but that’s less than half its value. I tested Roon using a Sound Blaster X7 USB DAC/headphone amp on my primary computer (a home-brew Windows desktop rig), and with a pair of Bowers & Wilkins’ MM-1 USB speakers on a corporate-issue Windows laptop set up as a remote control. Roon recognized that the laptop also had onboard speakers, and it detected the S/PDIF, coaxial, and analog speaker jacks on the desktop machine. Remote software for Android and iOS devices is in the works, but it wasn’t ready in time for this review. You can install Roon on as many remote computers as you like, but you can’t stream the same music to more than one endpoint at the same time (I'll describe some notable exceptions later). While that limitation renders Roon inferior as a multi-room system compared to, say, a Sonos system, Roon is far superior in terms of supporting high-resolution audio formats and codecs. Where Sonos maxes out with Apple Lossless Audio Codec (ALAC) and 16-bit/48kHz FLAC files, for instance, Roon supports FLAC, OGG, and several other formats at resolutions up to 24 bits and sampling rates as high as 384kHz. According to this post in the Roon forums, Roon Labs plans to add support for Direct Stream Digital files, too (DSD is the high-resolution file format used in Super Audio CD). 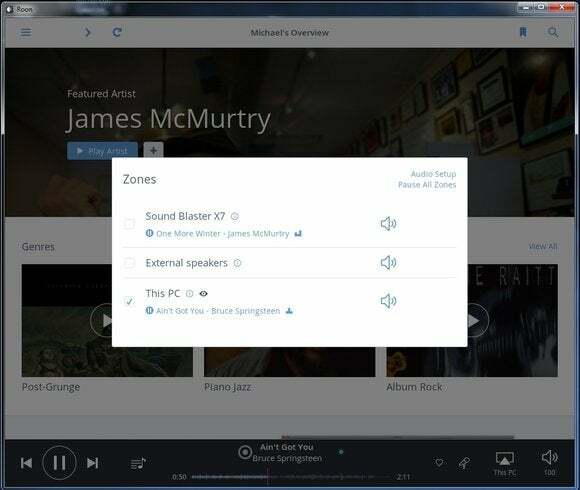 Support for Meridian’s MQA format is also in the works. You can group AirPlay devices into zones and stream the same music to them, but I wasn't impressed with the experience. Roon can also stream music to any device that supports Apple’s AirPlay technology, which gives the software better multi-room audio capabilities. You can send independent streams to each AirPlay endpoint (as well as to the primary computer and any other networked PC or Mac endpoints), or you can group AirPlay endpoints in zones and stream the same music to them. AirPlay isn’t the best multi-room audio system I’ve tested. Everything gets converted to Apple Lossless, which is fine unless your source material is encoded at a higher resolution or sampling rate. Stream a 24-bit/96kHz FLAC file for instance, and AirPlay will down-convert it to 16-bit/44.1kHz Apple Lossless. That particular sampling-rate conversion is especially problematic: Because 96 is not an even multiple of 44.1, the down-conversion can introduce all sorts of quality issues. To Apple’s credit, AirPlay is widely supported and can be found in a number of powered speakers and A/V receivers. I did a limited amount of wireless streaming using the new Wren V5US powered speaker and the even newer Naim Mu-so soundbar and experienced some troubling dropouts on both speakers. It’s impossible to pinpoint exactly which point device in the chain is responsible for this; it could have been the Roon software, the AirPlay protocol, my Wi-Fi network, or the endpoints themselves. The folks at Roon Labs say my AirPlay experience isn’t typical, but I can’t recommend using Roon and AirPlay as a multi-room audio system unless positive experiences from other reviewers indicate my experience really was an anomaly. If you want a higher-end solution, Roon also supports Meridian’s streaming hardware, and it will support Linn Product’s hardware soon. Roon reveals the most minute details of how tracks are being processed and decoded. Roon Labs Founder and Director of Engineering Brian Luczkiewicz tells me the company is also developing a streaming protocol of its own. Dubbed RoonSpeakers, one of the protocol's primary benefits, according to Luczkiewicz, will be that “the endpoint owns the master clock. This allows us to take advantage of the premium clocking hardware in high-end endpoints in a way that [other protocols] can’t.” Here’s hoping some of the same companies building wireless speakers in the price range of AirPlay, PlayFi, and AllPlay products will adopt it. The last highlight of the Roon’s streaming capabilities that I’ll point out is its ability to inform you of exactly what’s happening to the audio stream at every stage of playback. Roon will not only identify the final output stream as low or high quality (with a colored icon in addition to text displayed in a pop-up window), but it will identify the file format, sampling rate, and bit depth of the source file, and then report every step of the conversion until the stream is output. So Roon is an awesome tool for music playback, but that’s less than half its value. The Roon features that really knocked me out are its database- and metadata-management capabilities. The folks at Roon consider my library of 1750 albums (20,757 tracks) to be small. By their standards, a mid-sized library would contain 3000 to 5000 albums and a big library would contain upwards of 20,000 albums. One way to get to higher numbers quickly is to subscribe to Tidal, which streams CD-quality music (16-bit, 44.1kHz FLAC files) over broadband. Roon will combine the music you own with the music you “rent” into one big library and manage all of it for you. The software instantly fixes everything that’s wrong with Tidal’s abysmal user interface, and it does a brilliant job of using that service to expose you to new music based on what you’re already listening to. Roon Labs wants to recreate the album experience, where you could learn just about everything that went into the production of a record. Roon Labs’ stated objective is to use metadata to return our music-listening experience to the days of the LP, with its beautifully designed large-format cover, its gatefold art, and the lyrics and extensive liner notes on the record’s sleeve. 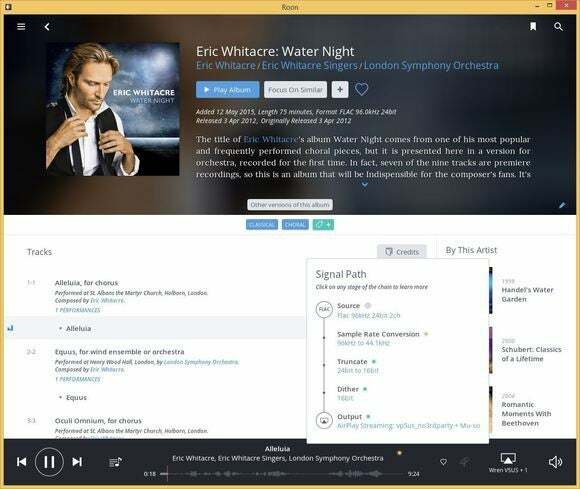 Roon will find all of that information about your music and present it in a browser-like playback window. That’s part of the reason the software is being sold as a subscription service versus a one-time purchase. Roon builds some of its metadata in house, but it also licenses material from third parties, including Rovi and LyricFind. In doing so, Roon Labs incurs recurring costs that it recoups through its subscription fees. For most albums, Roon’s database will provide a description of the album; high-resolution album art; a biographical sketch of the artist; a critical review; a discography of other recordings by that artist; credits for all the performers, producers, engineers, and other personnel involved in the recording; the album’s original release date; the length of the album; the recording’s format, sampling rate, and bit depth; the complete lyrics for each song; editable, clickable tags indicating the genre(s) the album belongs to; and links to any alternative versions of the album (such as the ones included in boxed sets). Roon will even tell you if an album is incomplete and help you identify the missing tracks. Almost every piece of information that’s presented is clickable, encouraging you to explore other recordings by that artist, contributions that artist made to other musician’s albums, other projects the producer or engineer were involved in, and more. Roon is made for people who love music and want to immerse themselves in listening, exploration, and discovery. Is it really worth $119 a year? I do have two minor nits to pick with Roon Labs. First and foremost, the company needs to finish its Android and iOS device software—pronto. Second, it needs to add the ability to wake the primary computer from a low-power sleep state. As it stands, the company recommends leaving the computer powered up 24/7 or using a third-party wake-on-LAN utility on a tablet or smartphone. That’s lame. I shouldn’t have to waste electricity running an unused computer all day long, and I shouldn’t have to use third-party software on a secondary device to wake my PC from hibernation. As for its worthiness: You don’t buy Roon, you subscribe to it for $119 a year. Alternatively, you can purchase a lifetime license for a one-time payment of $499. If music is something you only play in the background while you’re doing other tasks, you probably won’t get enough benefit from Roon to justify that annual cost. But if music is one of your passions, if you yearn for every detail about what went into the production of your favorite records, if you crave new music discovery, if you want to learn who influenced the artist, the engineer, or the producer—and who they influenced or inspired in turn—Roon is a must-buy. Correction: This story was updated to remove the assertion that the Apple Lossless codec was limited to 16-bit resolution and a sampling rate of 44.1kHz. Roon is one of the best tool for managing large and complex music libraries, and it will only get better as the software evolves.